The Kangoo is a van with doors, no less, no more. It majors on practicality; you'll find frills elsewhere in the Renault range. Select Kangoo from our search menu and you'll be offered a list of classifieds full of panel vans, only the odd passenger machine among them. Select MPV and that will filter out the commercials, and whittle the number to one that's more manageable too. The Kangoo's enormous practicality is underlined by the number that are converted for use with wheelchair access - the low boot lip, vast rear opening and massive boot making it ideal for that purpose. 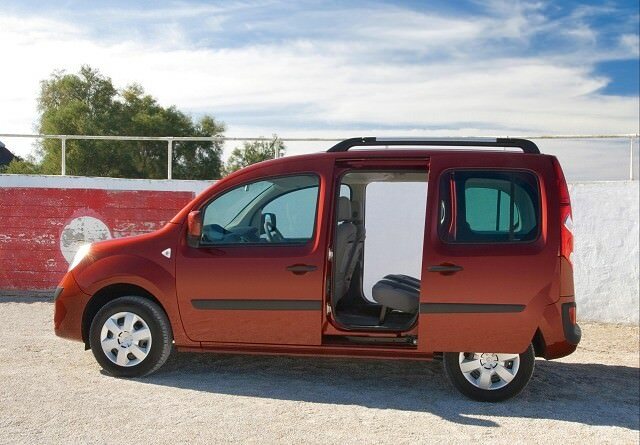 Add sliding side door access and the Kangoo is about as effortless a car to get in and out of as is possible. That's good for everyone, and families are certain to find the Kangoo's huge versatility a real boon compared to conventional hatchbacks - or even some so-called compact MPVs. Those on a budget will appreciate the inexpensive prices and low cost running bills, too. The sacrifices for all of this are obvious inside, the Kangoo's van-derived interior built without much thought to eye-pleasing style or soft touchiness, though it does feel tough. After all, if it can survive the beating a tradesman will give it then the average family shouldn't cause much harm inside. The diesel might not be that common, but it's worth looking out for one for not just the economy it brings, but the greater performance. Trim is down to your budget - and what you can find - while a large number of Kangoos have been modified for use by handicapped passengers and drivers.